Can your heirloom chair be saved? Can your favourite sofa be given a new lease on life? How about the furniture in your business’ waiting room? Let’s take a look at some reasons why reupholstering may be the best choice for you. Fashion changes – bring your furniture more in line with your home or work spaces’ overall interior design with a new material and pattern. Reupholstering and repairing antique and heirloom furniture. Material repairs for when your leather, vinyl, or fabric is torn or otherwise damaged. Interior foam shaving or replacement. Repairs or replacement of webbing or padding. Re-springing or the mending of existing springs. Weather-proofing outdoor furniture and boat finishings. Fitting out work spaces, cinemas, retail areas, waiting rooms, office furniture, medical chairs, exam tables, and benches. How Much Damage can be Dealt With? At the lowest level of damage all your furniture might need is a recovering. In this case all that’s generally done is the current covering material is removed and replaced. This may become a bit more complicated if the material has patterns sewn into it like the classic diamond back look. Reupholstering is more involved. 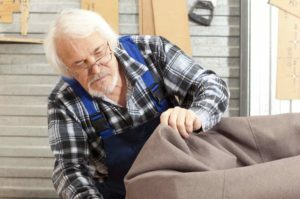 This occurs when internal components such as springs, foam, or other forms of padding need to be repaired or otherwise manipulated in order to put the piece of furniture back into working order. And then of course there are the types of repairs that involve the framework and joints; for example if your chair has a wobble or the joints have come loose from their dowels and glue bindings. If you take a look at our gallery you’ll examples of furniture that were pretty far gone before we got to work on them. Is your furniture worse off than these examples? If you’re not sure exactly what it is that you need, then please don’t hesitate to ask. We’d be more than happy to lend a helping hand. • Added a touch of class to restaurants. • Fitted out retail stores. • We’ve even renewed dentist chairs. If you’d like to lend a new look to your home or business we’ve worked hand-in-hand with a multitude of interior designers, independent consultants, and architects and have on many occasions been called in to consult on how to add just the right fabric or piece of furniture to compliment someone’s new design.